Before moving to Kiev my total amount of walking had been 3 minutes on the treadmill at gym, walking from the car to my house and from the car park to the shops at the shopping mall. All those hours spent browsing shops at the shopping mall did not prepare me for my new life of walking to work. At first the morning walk was hard, there is an incline, lots of steps, uneven path, it played hell on my calves. The first few times the walk took me 40 minutes. I hated it. Especially in the rain when cars deliberately aimed for large puddles so they can send a spray of dirty water your way. But I persevered and am pleased to say I actually enjoy my brisk walk in the chilly mornings. Being part of a workforce all walking to work gives me a sense of belonging. It now takes me 20 minutes to walk to work instead of the initial 40. Looking at the jelly flesh covering my legs, there seems to be a little less of it which is probably a good thing. So walking might be good for me after all. I might even end up with long slim well-muscled shapely legs like the Ukrainian women have, but I won't hold my breath. Those legs take years. I bought two pairs of ankle boots before I left Cape Town, thinking that made me ultra-prepared for Kiev. However, boots for mall-walking and boots for road-walking are not the same thing as I am discovering. And boots for snow walking is something else entirely. I don't want to give up my morning walk so I guess that means some serious boots made for walking shopping is on the cards. Admission of guilt: After the first night walking home, I decided my reward for a hard day's work each day is to take a taxi home. Last Saturday I met a friend who took me to explore the city centre of Kiev. I experienced the underground rail system for the first time. Terrifying. People who all moved purposefully knowing where they were going, crowds of them, all hemming you in and suffocating you. And then there were the escalators, so long, steep, a vertical drop to the centre of the Earth, moving far faster than any escalator I'd ever experienced, and the holding on part didn't move at the same speed as the steps part. Scary. As someone who is not good with heights and escalators in general, this was a time to dig deep and face my fears. My friend was supportive, standing in front of me so I couldn't see the drop, letting me babble on incoherently so that I could distract myself. Somehow, I don't think I am ever going to be able to travel on the metro underground by myself. We walked and walked searching for The Chocolate House which did not sell chocolate as we discovered, but held an interesting abstract art exhibition and was the venue for a couple of weddings we gatecrashed. The rain came down in buckets and we were drenched, droplets of rain dripping down from the ends of our noses as we took temporary refuge in telephone boxes. My gym trainers are not waterproof as I have discovered. Maybe because they are meant for indoor use and it goes without saying that it never rains inside a gym. This Saturday my lovely teaching assistant took me to a second hand clothes market so I could stock up on some winter clothes. We took a bus to get there, thankfully no metro and no escalators. Lots of the clothes looked new or hardly worn at all. I bought two coats, a longish one and a shorter one, 4 100% wool sweaters and a polar fleece and paid only $85 for the lot. That's what I call a bargain! So hopefully I'll be warm for the winter which seems to be approaching rapidly. The temperatures lately have dropped to about 5 degrees Celsius and my Cape Town winter gear is hopelessly inadequate. Next weekend I think I'll do some boots shopping. Apparently there is something you can put under your boots to stop you from slipping in the snow. I need to get that and a woolly hat and maybe a scarf or two. I already have a balaclava and ear muffs from my visit to Siberia several years ago. Time to have another coffee! Cindy Vine is the author of Not Telling, Defective and C U @ 8, all available on Amazon in paperback and kindle. One week has gone by so quickly and I am still alive. It's hard to believe that after all the visa hassles I finally made it to Kiev. My apartment is quite nice, spacious if a little dark because of all the trees outside blocking the sunlight. And brown walls, brown carpet, brown furniture doesn't help brighten it up. I do have a green chandelier though. The apartment is very reminiscent of the Soviet era. three nights in a row. That was the easy part. Walking to and from school has been a challenge. Especially in the rain. After the first night walking home, I started cheating and taking a taxi home. A full day's work and all you want to do is put your feet up and relax, you definitely need to get home as quickly as possible. As a person who's walking has been limited to a day spent browsing shops at a mall, I have had to dig deep for my morning walk but the fresh air is quite enjoyable. Or so I keep telling myself. It is only a 30-40 minute walk though. I can do it. Not to many people speak English here, or if they do they are too embarrassed to try. Haggling with the toothless old vegetable sellers who frequent the entrance to the metro is an interesting if entertaining experience. Lots of grunts and gestures. The bakery across from the school sells the most divine bread and pastries. To date I have been good and avoided the pastries. The school lunches are interesting at best and very Ukrainian. I've had a delicious borscht and some other strange things that I was unable to identify. Some tasted good, others okay and the long green things impersonating green beans but which tasted like fresh seaweed, I just could not do. My taste buds huddle up and start shivering at the thought. Being alone is well, lonely. To come home to an empty apartment is not nice and I really miss my kids and family, especially Siobhan who was always a loud presence. I find I talk to myself quite a lot and even start discussions about what I should eat for dinner. The problem is that I have now started answering myself. I wonder what I'll be like after a few months? As I can't get the TV working (I need to get the landlord in anyway as the door to my little balcony where the clothes drying rack resides is jammed and doesn't open) I have been watching the TV series and movies I had saved on my hard drive. Movies and series I had been saving up for just a time like this. At least my internet works now. Friday night, stopped off at a little bar/restaurant on the way home with some colleagues and had a very large pint of draught apple cider that was delicious and refreshing. Yesterday there was a beerfest in town, but with rugby on and the rain pelting down, I decided to rather find the supermarket in between showers, and buy some washing powder to do some much-needed washing. Two weeks worth as I had a pile from the week I was holed up in a hotel in Pretoria waiting for my visa. Of course I have nowhere to dry the washing, so my clothes are spread out on the furniture in the lounge. Apparently the central heating is switched on by the government mid-October regardless of the temperature, and it stays on until about April next year. You can't adjust the settings and temperature, and while it is minus temperatures outside people walk around in shorts and t-shirts inside their apartments. I suppose when that happens my washing will dry quite quickly. I found an iron in the cupboard so guess I might have to finally learn how to iron. Something I have managed to avoid my entire life so far. Well I guess it's time for me to use some of that heavenly bread I bought and make myself some breakfast. I want to do some writing today. My goal for yesterday was watch rugby, find a supermarket and do my laundry. I reached all targets. Today's goal is to write my blog, pack away my hopefully dried clothes, do some school work and work on Hush Baby. Sundays will definitely have to be writing days as there is no time during the week and when I get home I just want to chill. Macdonald's French fries taste like cardboard when they are cold. This was my great discovery yesterday after I spent too long trying to find my way back to my hotel with my food supplies for the day. GPS on your phone is an amazing invention. However, you need a navigator to operate it for you as the other drivers do not appreciate you trying to slide the screen open and check the directions while driving. It is extremely difficult to keep your eyes on the road, be aware of cars tailgating you, as you try to read the directions on your phone before the screen goes black. And then when you get a chance to sneak a look again, you find that you have just driven past the turn-off. Someone told me that Pretoria is the best city in South Africa as the way the roads are set up and designed you can never get lost. However, you can ride in circles a lot of the time, seeing the place where you want to be but the one way road you are on does not take you there. I hate orderly one way roads. Give me a mish-mash of chaotic roads any day. At least they take you where you want to go. And of course all the streets that have changed names don't help either. Google maps hasn't caught up with all the name changes. Some parts of the street still have its old name and yet other sections of the same street have been renamed. And then some streets haven't got any name while they make up their minds what to call it. Pretoria has to be my least favourite place. 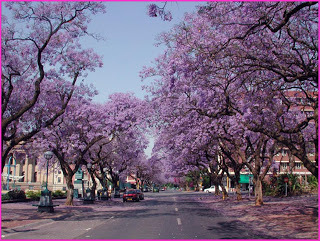 It is a very pretty city I am sure when the trees are in full bloom. Unfortunately this time of year you only drive down avenues of brown trees, no pretty purples and mauves to brighten your day. And my day needs brightening. I have been struggling to get my Ukraine visa. The problem is that I was married and now I'm not. My teaching degree is in my married name and after my divorce I reverted back to my maiden name. This has never proved to be a problem in the past. Now it is a nightmare, and shifty agents who I had to employ to get documents for me when I was still in Tanzania have not helped. They take your money and do not deliver what you paid for. I should have know when they arranged to meet me at a Macdonald's car park to give me the documents that they were not to be trusted, but when you are desperate you do not always act rationally. Long story short, I went to the High Court in Cape Town myself, and in 20 minutes I had my divorce papers, officially stamped and with an apostille, all for free. No charge. The agents charged thousands. Bastards. So why I am in Pretoria, you might ask? I had to get an official document from the Ukraine government inviting me to come for a business visit. This was sent to me urgent priority mail through UPS. It arrived 1.30pm in Cape Town. They only processed it at 4.30pm and decided it was too close to the close of business to deliver, even though it said extremely urgent. I find it strange that an international courier agency closes for the weekend, but UPS does no deliveries over the weekend, no matter how urgent they are. I booked my flight to Johannesburg for Monday night and booked a hire car, praying hard that I'll get these documents from the Ukraine before I left. Thank goodness I set my alarm so I could phone UPS Monday morning at 8am the moment they manned their phone lines. My documents were already with a driver and would only be delivered late afternoon. Not good enough. That was when I had to be at the airport. I persuaded them to remove the documents from the driver's car and hold onto them for me to collect myself. A huge relief when I had those documents in my hand. Stage one done. I arrived in Johannesburg at 9pm and collected my hire car. Very impressive, brand new car with only 3km on the clock. Of course I hadn't booked a hotel. I thought I was driving in the direction of the one we always stay in when we have to transit in Johannesburg, but as I can never know where west and east is and north and south (I failed that badge in Girl Guides), I found myself on the road to Pretoria. As I had to be there to hand in my visa application the next morning, that was probably not a bad thing. However, my knowledge of Pretoria and where to stay is negligible. I had thought Pretoria was 30km from Johannesburg. I was wrong. It's 60km. So I headed into the night not too sure where I would be laying my weary head. I decided to take the second turn into Pretoria and soon spotted a Stayeasy Hotel. Great choice, breakfast included, it's like a Novotel and at a good price as well. The next morning I was up bright and early to head to the Ukraine Embassy. I was pleased to discover it wasn't too far away from where I was staying. Thing were looking up, right? Not. When getting my paperwork together I noticed the photos I had taken the day before were missing. A mad dash into town, driving in circles to find a photo place. Then I realised I didn't have a pen. I tried to buy a used one from the cashier at the photo shop but she said they only sell photos not pens. Seriously, she had three, she could have parted with one. I studied the GPS and memorised the road names and made my way to the Ukraine Embassy only to discover the consulate section was closed and was only open between 3 and 4 on a Tuesday, closed all day Wednesday, open 3-4 on a Thursday. Back to the hotel, read some, and at 2 headed back to the Embassy and waited outside for it to open. There were a group of us waiting and they only let people in one at a time through the gate. I hate waiting. They took my papers, gave more than half of them back saying they didn't need it even though their website had said they did, and told me to come back Thursday between 3 and 4. And here I sit. Typing this blog, trying to keep my mind off the visa. Will I get it at 3? My nerves are shot, the tension is causing pains in my back. My flight to the Ukraine is tomorrow night. Please God let me be on it.